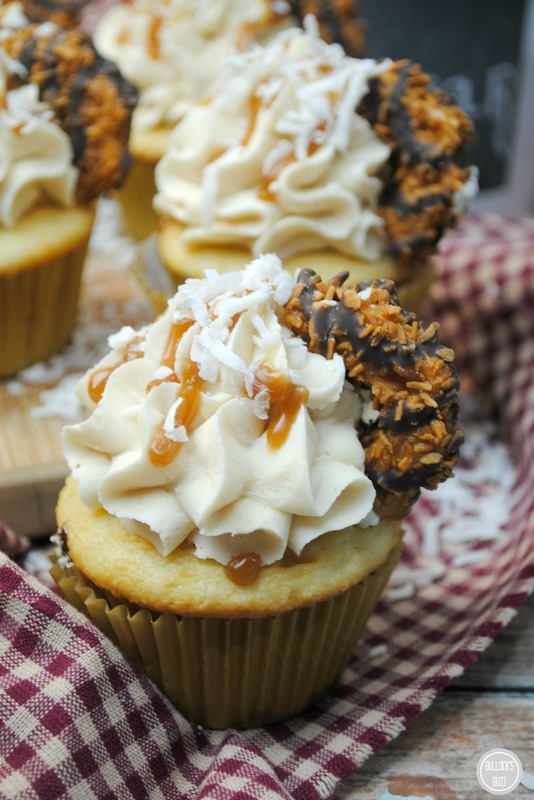 Samoa Cupcakes: Girl Scout Cookie Inspired Cupcakes! These light and moist Samoa Cupcakes are made with rich vanilla, buttermilk and sweet cream butter topped off with a mouth-watering Coconut Caramel Frosting, and then crowned with a Samoa cookie. Girl Scout cookies have always been a weakness of mine, especially the Samoa cookies! Mmmm…all that chewy, gooey chocolatey, caramel coconut goodness! It makes my mouth water just thinking about it! 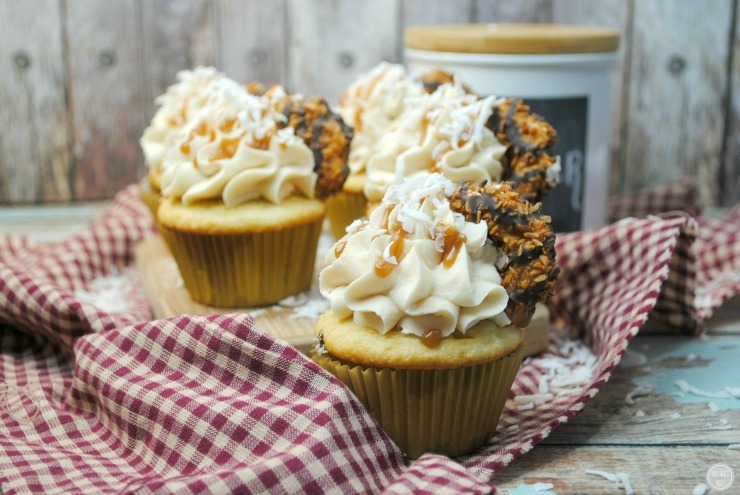 I didn’t think it could get much better than that, until I tried these amazing Samoa Cupcakes! 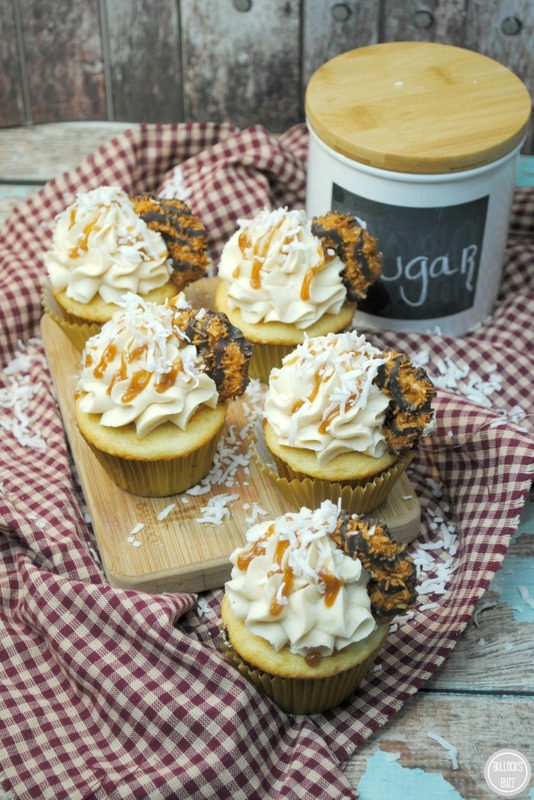 Made with rich vanilla, buttermilk and sweet cream butter, these rich and moist cupcakes are topped off with a mouth-watering Coconut Caramel Frosting and crowned with a Samoa cookie. It doesn’t get much better than this! 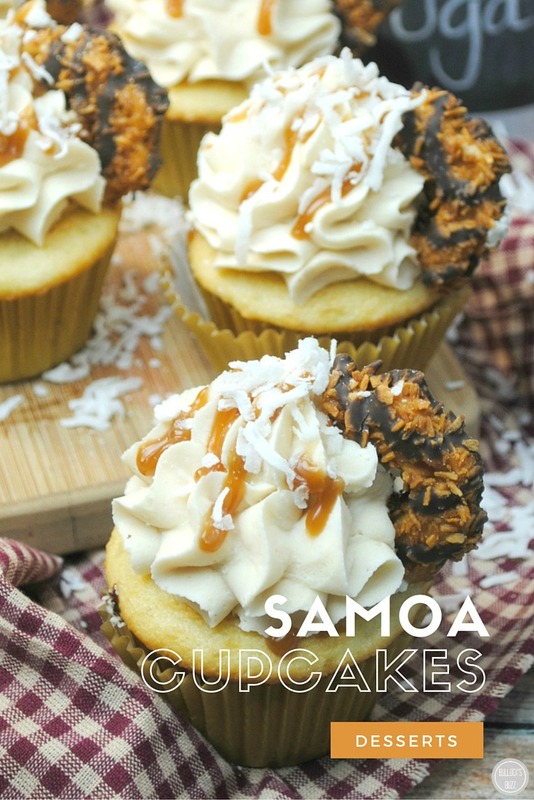 Ready to see how to make these scrumptious Samoa cupcakes? Begin by preheating the oven to 350 degrees, and fill the cupcake pan with liners. In a medium-sized bowl, combine the flour, cornstarch, baking soda, powder and salt, mixing well. Set this bowl off to the side. In a mixer bowl, cream the butter and sugar until it is light and fluffy using the paddle attachment. If you don’t have a stand mixer, you can always use a large mixing bowl and an electric hand mixer. Now add the oil to the butter and sugar mixture, followed by the eggs – one at a time. Make sure you allow each egg to become fully incorporated into the mix before adding the next. Follow the eggs with the vanilla. Next, in either a glass or another small bowl, combine both milks, stir, then pour into the bowl with the dry ingredients, stirring as you go. Now slowly add this mixture into the mixer bowl, making sure it becomes completely incorporated. I like to let my mixer run for about 30 seconds, then scrape the edges of the bowl, and then let it run for 30 more seconds. This ensures that all ingredients are completely combined. You should now have a nice, smooth cupcake batter. Use a 1/4 measuring cup and a spoon and spoon the batter into the liners. Bake at 350° for 21 minutes. While the cupcakes are baking, add all of the frosting ingredients into your standing mixer bowl (or a medium bowl with a hand mixer) and mix until all ingredients are completely combined and stiff peaks form. If you notice that powdered sugar pebbles are forming, add in 1-2 tbsp more of heavy cream. If the frosting is too thin, add up to 1/2 C powder sugar. Make sure you mix well until the frosting is stiff and doesn’t fall off a spoon. Add the frosting into a star tipped piping bag, and frost the cupcakes. Next, drizzle some caramel, followed by a sprinkle of coconut. Last, but not least, top with a Samoa cookie. Now all that’s left to do is to serve and enjoy these Samoa Cupcakes! And don’t forget the handy-dandy printable version below! In a medium sized bowl, combine the flour, cornstarch, baking soda, powder and salt, mixing well. Set this bowl off to the side. In a mixer bowl, cream the butter and sugar until it is light and fluffy. Now add the oil to the butter and sugar mixture, followed by the eggs - one at a time. Make sure you allow each egg to become fully incorporated into the mix before adding the next. Use a 1/4 measuring cup and a spoon and spoon the batter into the liners. Bake at 350° for 21 minutes. Add all ingredients into a standing mixer and mix until combined and stiff peaks form. If too thin add in 1/2 C powder sugar. Mix until the frosting is stiff and doesn't fall off a spoon. Top with a Samoa cookie.